Ingesting hops can be highly toxic to susceptible dogs. 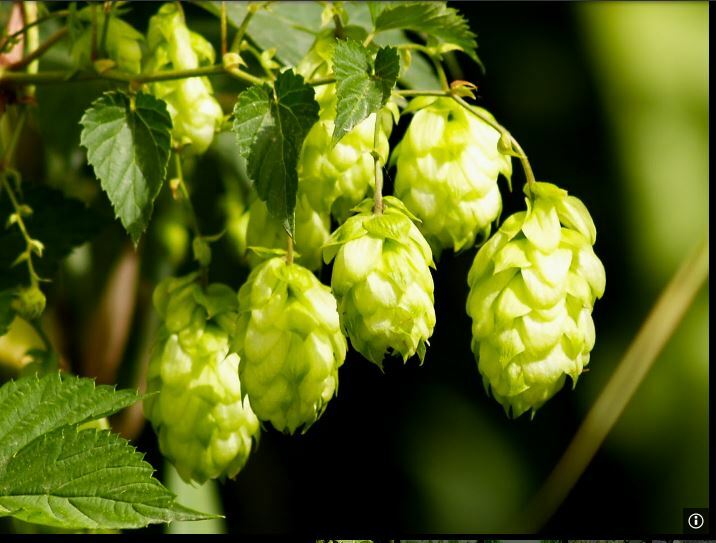 Hops can act as an inciting cause or trigger for malignant hyperthermia but it seems the animal must have a genetic pre-disposition for this to occur. Malignant hyperthermia, an uncontrolled increase in body temperature, is a rare life-threatening condition usually triggered by exposure to general anesthetic agents, most commonly volatile anesthetics, in certain genetically susceptible humans, pigs and horses. Caffeine can also act as a “trigger”. Hops have been shown to trigger the reaction in susceptible dogs and cats. The triggers can induce a drastic and uncontrolled increase in oxidative metabolism, the utilization of oxygen, in skeletal muscle. This overwhelms the body’s ability to regulate body temperature. The result is high fever leading to circulatory collapse and death if not immediately treated. The susceptibility to malignant hyperthermia is often inherited as an autosomal dominant disorder, for which there are at least 6 genetic sites of interest. In 50–70% of cases, the propensity for malignant hyperthermia is due to a mutation of the ryanodine receptor located on the sarcoplasmic reticulum of skeletal muscle cells where calcium ions are stored. The ryanodine receptor acts to open calcium ion channels that allows the ion to enter the skeletal muscle cells and initiate contraction. Malignant hyperthermia results when the normal processes of entry and subsequent removal of calcium ions from the muscle cells are interfered with. The process of sequestering excess calcium ion within the cell consumes large amounts of adenosine triphosphate (ATP), the main cellular energy carrier, and results in the generation of the excessive heat (hyperthermia) that is the hallmark of the disease. The muscle cell is damaged by the depletion of ATP and possibly the high temperatures and cellular constituents “leak” into the circulation. The other major known causative gene for malignant hyperthermia is the protein encoding a different type of calcium channel. There are two known mutations in this protein. When these mutant channels are expressed in human embryonic kidney cells, the resulting channels are five times more sensitive to activation by caffeine (and presumably volatile anesthetic agents and hops). Other mutations causing malignant hyperthermia have been discovered but. in most cases. the relevant genes remain to be identified. Research into malignant hyperthermia was limited until the discovery of “porcine stress syndrome” in Danish Landrace and other breeds of pigs. This “awake triggering” was not observed in humans and cast doubt on the value of the animal model. However susceptible humans were discovered to develop malignant hyperthermia the “awake trigger” in stressful situations. This supported the use of the pig model for research. Pig farmers began to expose piglets to halothane. Those that died were malignant hyperthermia-susceptible, thus saving the farmer the expense of raising a pig whose meat was not marketable. This also reduced the use of breeding stock with the genes. The condition in swine was also found to be due to a defect in ryanodine receptors. The causative mutation in humans was only discovered after similar mutations had been described in pigs. Another argument for the use of animal models in research. Sorry, that was my career for thirty-six years and I still have to climb onto the soap box from time to time. A causative mutated ryanodine receptor gene has been identified in Quarter Horses and other breeds and is inherited as an autosomal dominant. It can be triggered by overwork, anesthesia, or stress. In dogs the susceptibility seems to be autosomal recessive. A malignant hyperthermia mouse model has been developed using molecular biology techniques. These mice display signs similar to those in susceptible animals when exposed to halothane as a trigger. This model was used to demonstrate that the injection of dantrolene, a muscle relaxant, reversed the response to the halothane in these mice and in humans. The current treatment of choice is the intravenous administration of dantrolene, discontinuation of triggering agents, and supportive therapy directed at correcting hyperthermia, acidosis, and organ dysfunction. Treatment must be instituted rapidly on clinical suspicion of the onset of malignant hyperthermia. After the widespread introduction of treatment with dantrolene, the mortality of malignant hyperthermia fell from 80% in the 1960s to less than 5%. However, the clinical use of dantrolene has been limited by its low solubility in water. This means it must be dissolved in large volumes of fluids complicating clinical management. Azumolene is 30 times more water-soluble than dantrolene and also works to decrease the release of intracellular calcium by its action on the ryanodine receptor. In susceptible pigs it was just as potent as dantrolene. However it has not yet been approved for use in humans. Hopefully those clinical trials are in progress. Research in mouse models continues in efforts to more completely describe the genetic mechanisms that trigger this condition. So we know that hops can be poisonous to at least some breeds of dogs and also sometimes to cats. The cones are the culprit when enough of them are eaten. The initial symptoms are restlessness, panting, abdominal pain and vomiting. In serious cases, symptoms progress into seizures, rapid heart rate and life-threatening high body temperature. Greyhounds seem to be the most susceptible breed but also susceptible are golden retrievers, St. Bernards, Dobermans, border collies and English springer spaniels. Hops grown by aficionados pose a threat when the mature cones are low enough for the animal to reach or drop to the ground. With home-brewing becoming more popular we could see an increase in hops poisoning. A potentially bigger threat than hops plants is dogs getting into bags of stored hops or spent, dumped hops sediment. Dogs are far more sensitive to ethanol than humans. Even ingesting a small amount of a product containing alcohol can cause significant intoxication. No matter how popular beer drinking dogs are on U-Tube hops poisoning is probably not a threat but intoxication from the alcohol is. Alcohol intoxication results in vomiting, loss of coordination, disorientation and stupor. Sound familiar? In severe cases, coma, seizures and death may occur. Dogs showing mild signs of alcohol intoxication should be closely monitored, and dogs that are so inebriated that they can’t stand up must be taken to your veterinarian.